It was an unusually cool evening last night for August. I had my office sliding glass door open and was enjoying the cool air and sounds of nearby crickets and the distant hooting of a pair of Barred Owls across the lake. The sliding glass door opens to a second floor deck that is within arms reach of several tall trees behind the house. As I was reviewing and processing images, I heard an unfamiliar rustling in the trees. I grabbed my halogen spotlight and shined it into the trees. 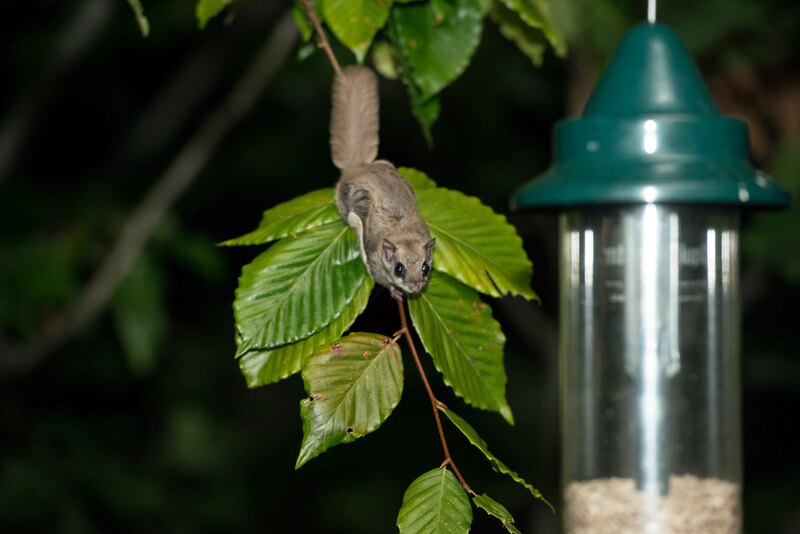 To my surprise, there were at least three Southern Flying Squirrels that were attracted to my bird feeders. 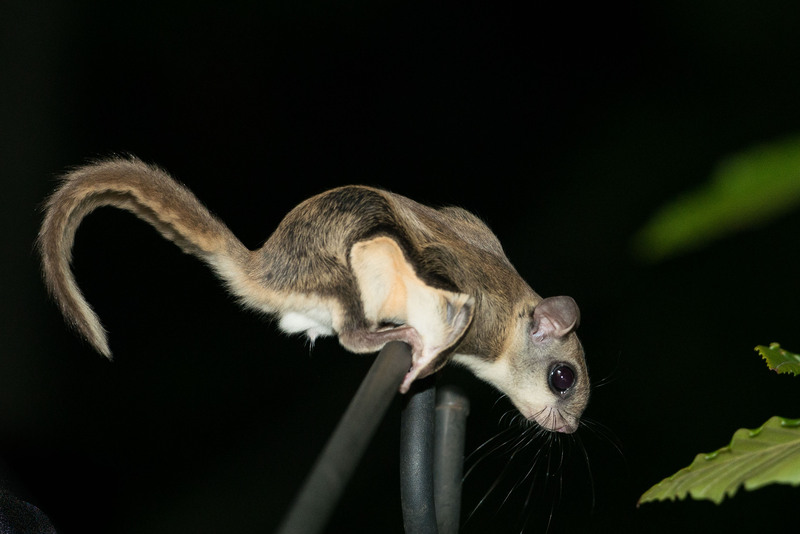 I had only seen flying squirrels in our neighborhood once before and that was just a couple of weeks ago. Also surprising was that the flying squirrels did not climb into the trees or take off as I shined the light on them. They were not afraid. They were too focused on my bird feeders to be bothered by me, or so it seemed. Therefore, I quickly set up my Nikon D800 with a 70-200mm lens and Nikon SB900 Speedlight, and began to photograph the squirrels. I was able to get within three feet of them, which was actually too close for the lens I was using and, therefore, I backed off several feet to focus on them. They stayed for a couple hours, at times leaping or flying to the feeders that hung off my deck. Eventually, after I felt that they had eaten enough of my bird food and I had enough photographs, I removed the feeders from the deck, and the squirrels disappeared into the trees and night. My bird feeders are “squirrel proof” to keep the many gray squirrels and a white tailed squirrel that live in the trees from emptying them. The feeders close from the weight of the squirrels when they climb on them. 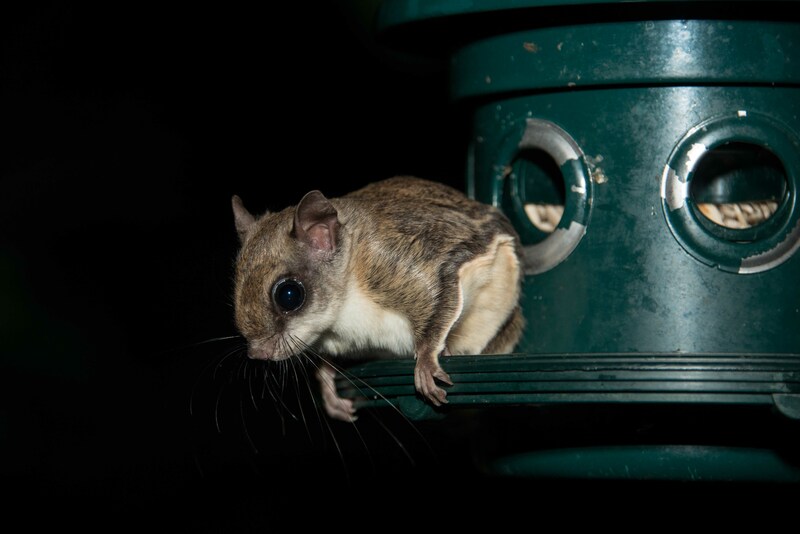 Apparently, the flying squirrels weigh much less, which is obvious by their much smaller size, so this evening I removed the feeders before they showed up again. 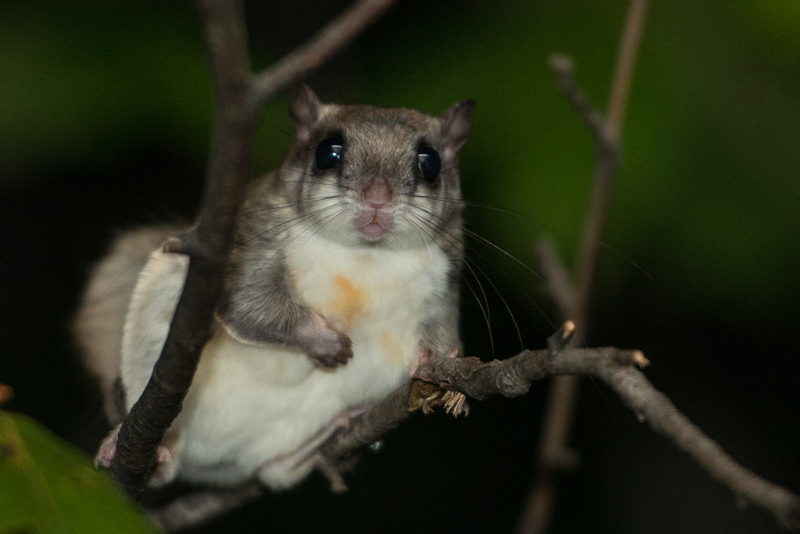 Southern Flying Squirrels are one of two species of flying squirrels in North America. They actually do not fly, but rather glide using a membrane, called a patagium, which is a fold of fur covered skin that starts at their wrists and extends along their sides, and finishes at their ankles of their hind legs. 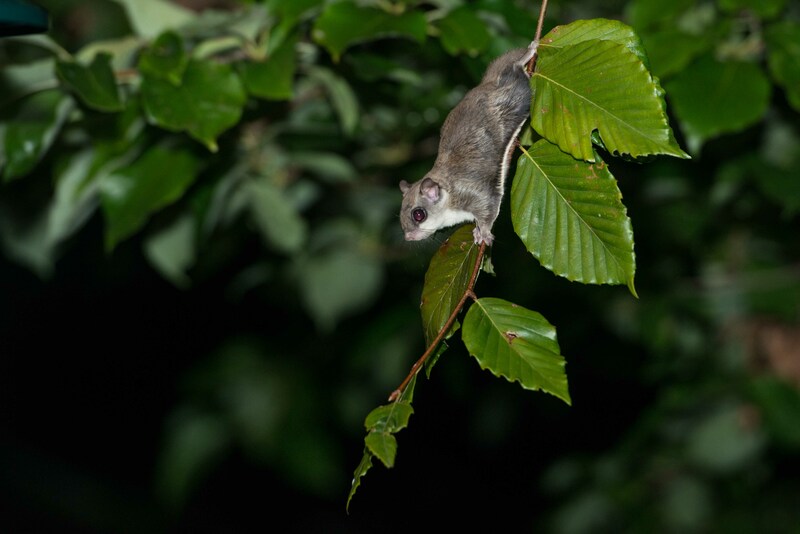 They can glide as much as 100 feet and propel themselves from trees with a running start or just leap off branches. 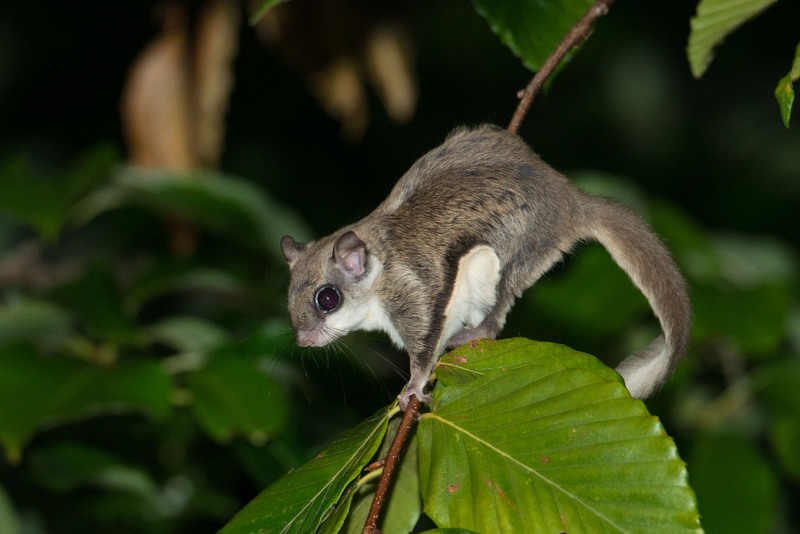 Flying squirrels are very social animals and live and feed in groups. They feed on a wide variety of food, besides the bird food in my feeders, to include acorns, insects, buds, mushrooms, fungi, bird eggs and nestlings, and flowers. They often have two litters of 2 – 7 young each year. They are nocturnal, which explains their very large eyes, and why I saw them last night. Seeing and photographing the flying squirrels was exciting, but they only topped off an equally exciting event earlier in the evening when my wife and I were walking along our lake. While walking, we saw a Red Fox on the edge of a wooded area. It stayed there long enough for me take several photos. 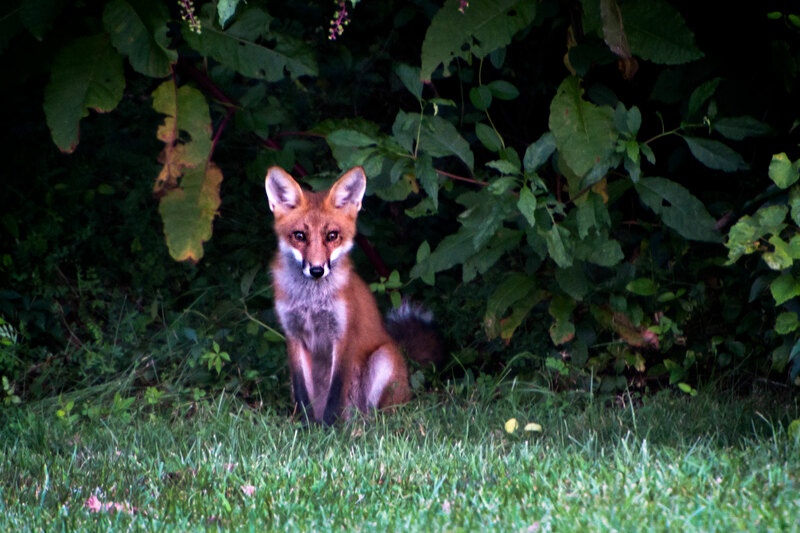 It was challenging to get a decent image, because it was dusk, the wooded area was shaded, and the fox was moving about. As I usually do, I had one of my cameras with me (Nikon D800) and a lens that extended to 400mm, enabling me to get in close and fill the frame with the fox. The D800’s high ISO, capabilities enabled me to get a fast enough shutter speed to capture the below image. The image is not gallery quality, but it very well documented our fox sighting. There is an abundance of wildlife within the community where I live, and I will miss it when, or if, I move from Virginia. Comments on my blog and this article are appreciated and can be entered below by clicking on “Comments” found below the Like this: section. You can also read other’s comments there. This entry was posted in Nature, Wildlife and tagged Flying Squirrel, Red Fox. Bookmark the permalink. Thank you George. I struggled with the decision to leave the feeders out for the squirrels, but there may have been more than three of them or more on other evenings, meaning little to no food for the many cardinals, nuthatches, titmouse, wrens, finches, chickadees, catbirds, woodpeckers, sparrows, etc. that visit my feeders everyday. Great story and images Steve! I have lived in the area all of my life and had no idea that these little guys were here. As always, thanks for sharing! Thanks for the comments Ernie. I have lived here for 20 years and never saw one until recently. I suppose that has a lot to do with them being nocturnal. Wonderful captures of the flying squirrels and the red fox. Awesome story and images Steve! I’d love to see and photograph one of these critters. Lovely photos and story, Steve. You’ve been threatening for several years to leave our community and I’ll be so sorry to see you go! 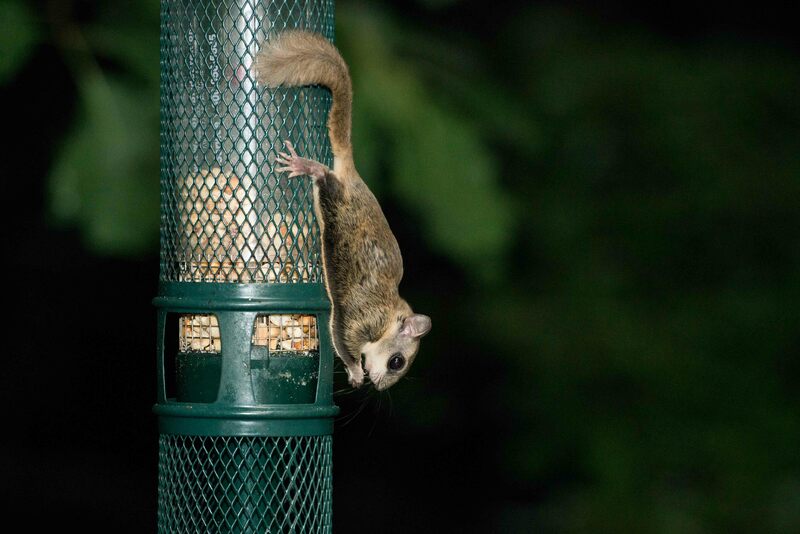 I’ve never see a flying squirrel, but I’m not sure they live in my area (central New York). Sacrificing a bit of bird food to get these beautiful photos was worth it all, in the end! Wonderful pictures and interesting information, Steve! There is a good chance flying squirrels are also in central NY. I, and many others that I know, did not know we had them here. Love all the wonderful photos and stories in your blog. 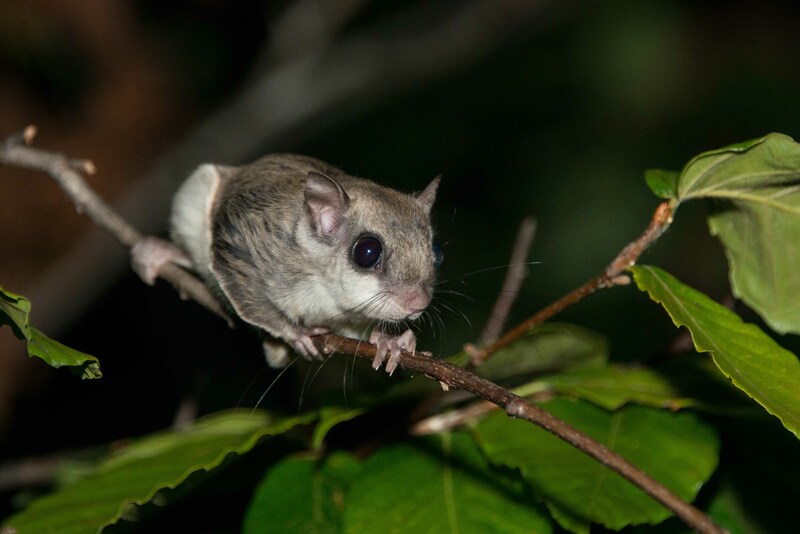 Some years ago, when I was a wildlife rehabilitator living in Greenwich Hill off Occoquan Road in Woodbridge, I acquired two juvenile flying squirrels too late in the season to be releaed in the fall. Hence, they overwintered with me. What a wonderful treat! The following spring, I took them to the National Wildlife Federation property when it was located on Rt. 7, where their nest box was affixed to a tall tree and the temporary plug removed from the opening. I watched as they cautiously stuck their heads out and investigated their new local. Releasing is a mixed emotional experience – joyful and bittersweet. I pray they went on to a happy flying squirrel life! Ha! Just when you think your feeder is safe, the squirrels start flying in. It’s hopeless. Great photos and story. Thanks.